A refreshing salad that's sure to bring a bit of Spring back into your life no matter the season. This slightly sweet, slightly nutty salad is a perfect side dish for those warm winter meals and easy for kids to help make. Place lettuce in large serving bowl. Toss apples in lemon juice and place on top of lettuce. 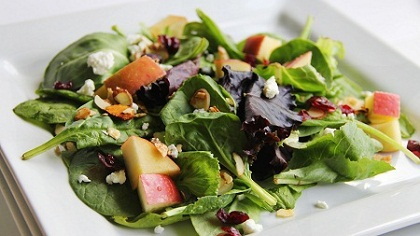 Place pecans, cranberries, and cheese on top of salad and keep cold until serving time. Combine the 6 last ingredients in an airtight container. Shake just before serving to mix. Serve on the side in a bowl with a serving spoon or toss with salad and serve immediately.